When you perform a search in Google you often see a site listed with additional links. Here is an example of how Servertastic currently appears. I would like to amend some of these links but Google doesn’t provide any way to do this. You can give Google a hint by the way you build navigation menus, use H tags and structure your site. But in reality some of it is trial and error. One thing Google did allow you to do was demote one of these links if it was irrelevant. This was done via Google Webmaster Tools (I would include a screenshot but the option no longer exists!). Sitelinks can often pick up promotional offers that no longer exist. Google have instead suggested if you want a page removing from Sitelinks you should remove that page from search altogether which can be done either by adding “noindex” meta tag or using the URL removal tool in Google Webmaster Tools. I can understand the reason. 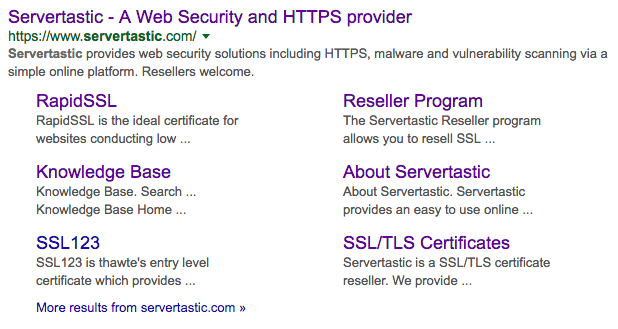 If you don’t want a page in Sitelinks then perhaps the page shouldn’t be listed at all.